Tuck need not turn to prayer for the answer to his question. The hardest thing to figure out about the Giants' performance in Sunday's 38-35 loss to the Packers was why they performed so much better than they did against the Saints. 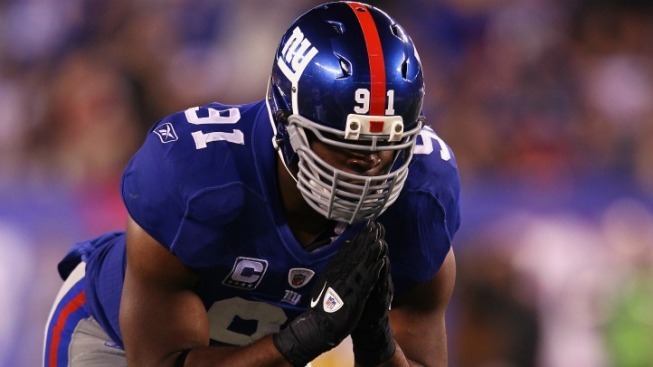 It's something that's been troubling Justin Tuck. He spent a little time sharing his disbelief about the inconsistency of the Giants' play with Jeff Roberts of the Bergen Record. "What kept me up was I know the Saints are a great football team, but nobody would say the Saints are better than the Packers. So how do we come out one week and play like we did and then come out this week and play like we did? And then two weeks ago play like we did against Philly? It doesn't ’t make any sense to me. Do I need to go see a shrink?" Tuck probably doesn't need to see a shrink to figure out the issue with the Giants. The problem doesn't appear to be psychological, although everyone should get the help they feel they need without any judgment from the outside world. The biggest problems with this year's Giants team are their ability to run the ball, their ability to stop the run and their ability to cover down the field when the pass rush doesn't get home. All of those things make it very hard for the team to dictate the pace of a game early and then relentlessly pound the opposition into submission. While the Giants are a terrific passing offense, they tend to wind up scoring points quickly and handing the ball back to the opposition. Unless the Giants are up big or late, relying solely on the pass rush defensively isn't a strategy that allows them to fully exert their will over their opponents. In the first three losses of their current losing streak, that lack of control has been the key reason why the Giants wound up on the short end of the stick. The 49ers, Eagles and Saints were all able to play the game they wanted to play because the Giants couldn't shake them out of their comfort zone. It's easy to look at those games, especially the Saints game, and be upset that the Giants didn't give enough effort to win the game. The truth is that all the effort in the world wouldn't have been enough to overcome the makeup of the team. Things were a bit different against the Packers, largely because the Packers share many of the same issues with the Giants. They are ineffective running the ball and struggle defensively, which turned the game into one that the Giants could make their own. None of this totally discounts the idea that there are lapses in intensity, effort, urgency or whatever other word you want to use. Tuck knows this team better than any outside observer and if he feels that the team came up short in those categories, they probably did. But there's a reason why the Giants haven't been blowing out teams this year and finding themselves coming from behind in the fourth quarter so often. It's because their shortcomings make it hard for them to put teams in a position of weakness. That reads as inconsistency, but, really, the team has been pretty consistent all season. The only thing that's erratic are the results of games that come down to the wire because the Giants don't have a team that can play them any other way.